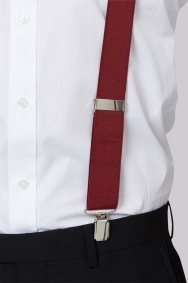 Perfect your tux-ready style with these bold red statement braces from Moss 1851. 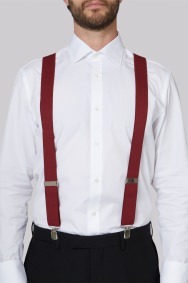 Nothing kills a slim party silhouette like a constricting belt wrapped around your middle. These perfectly crafted accessories provide support from the shoulder while framing your shirt beautifully. Vivid red adds a touch of preppy cool, and brings a welcome splash of colour to your big night out. They performed as hoped and held up well. Good item and comfortable to wear. Just what I wanted. 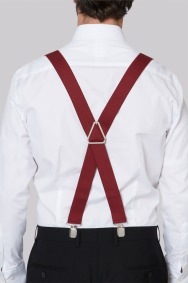 My DJ trousers have no belt loops and, because I have lost weight recently, I needed braces to keep them up! And not too expensive either. Very nice and the right colour for me. Fits like a charm, comfortable, good material. Good quality, just what was required. Nice pair of braces. Arrived quickly. I have rated it 5 stars because it looks good and works the way it is meant to. 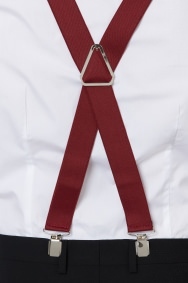 Nice colour and clips remain attached unlike cheaper alternatives, easy to adjust and sit comfortably. Braces are a revelation. Wish I'd worn them years ago. The sales person I dealt with was very polite and the transaction was completed in a very satisfactory way. I have not given full marks on theses braces because although they look a quality product they popped off during a function I was at twice. Provided good service and suggested new arrivals and suggestions to go with purchase. The clip on braces fitted perfectly. The colour was super.